I just like having things, even if I might not need them. Good thing I only collect digital items, the hundreds of books and thousands upon thousands of pictures would fill up my house real fast if they were physical items. Edit by Valcyrie: Change of text color. I almost forgot, I enjoy collecting Yu-Gi-Oh cards. I don't even use them for anything, I just sort them all and put them into a big binder. Hmm the thing i collect mostly at the moment is Steam achievements on my steam profile and arts of my Dragon some SFW and some NSFW. Reason i collect steam achievements is well i find it fun to play games for achievements as long as its no weird ones like start you for first battle or any like that crap. I prefer the ones where you have to play on hardest difficulty and get a challenge as you play. And so far i've collected 21 art pieces of mazrogal will most likely buy more from other artists ( have no drawing skills myself) And see how many different styles he can be drawn in. I have a total of 3 dragon statues/figurines in my collection (no pics for now) I hope to get more dragons to fill my new apartment with. Well outside of my statues/swords (that I'm posting on another thread), I also used to collect Pokemon cards. I was an avid collector of them, though I got rid of them a long time ago. I also collected Goosebump books. In fact I think this was the first thing I ever wanted to collect. I have completed the original series, the 2000 series, and the specials. The only thing I didn't finish was the Choose Your Own Adventure series. In fact I actually still have all my books, though they are currently still in storage. I also collect Game systems, new and old. I currently have all the game systems from PS2/Gamecube/Xbox Original era and onward. Now I'm in the middle of getting the really old game systems. Recently bought a Sega CD and Atari 2600. Currently working on getting a Dreamcast. Oh, just remembered, I also collect Zippo Lighters....yup Zippo Lighters. I'm not a smoker so I don't really use them on anything, I just like collecting ones with cool looking pictures on them. First one I got was a Resident Evil lighter (was a zippo with the Umbrella Logo). That's about all the major things I collect (at least that I can remember). Well, some time ago I collected old computers: something based on i8080, i8086, i8088, Z80 -compatible, PDP11, MSXs, Atari, etc. I can not say that I did it for the sake of collecting, mostly for fun and mainly for repairing them (as a rule they were non-working when I bought them). It was a good time. I gave up a few years ago because of work (when you're working with electronics is your professional occupation, it doesn't bring pleasure anymore). Also collecting coins, but I can't boast of their plenty. Just collect if something comes. FA | DA | FN | "Nothing is impossible, if you have sufficient resources"
I still have a small collection of dragon stuff, but it's mostly trinkets and things that have some personal significance to me. Gifts from friends and all that. As for other collections... I don't really know? I don't really have the disposable income to really collect anything, so I end up just taking things that gradually come into my possession or I end up bartering with indie shops and stuff. Somehow I ended up with two massive slat-boxes of gen 1 Pokemon trading cards. I own entire sets of Base, Jungle, Fossil, and Rocket cards. Twice over with Base set, even, but I sold one of the two complete sets some time ago. As far as I know, I have every official Wizards promo card numbered from 1 up to at least 30, plus many of the unmarked promos like the "E3" Pikachu and the gold-bordered Meowth card. Lots of misprints and shadowless cards and all that, too. Back when I had to leave my job last year I sold a LOT of the cards and I have no idea what's left. There was a very brief moment of time where I pretended to care about Amiibos, but honestly even though they are high quality figurines I can't justify $13 a pop. I guess my biggest collections are furry comics from the 1990's and (usually) worthless crap that I find personally amusing. Those two groups are not mutually exclusive. I collect random old trading cards from long since forgotten sets, like Bigfoot monster truck cards from the 1980's and crap. I developed a knack for kitschy nonsense because it became a big hit on my Twitch stream to "unbox" something weird before every show. I used to just do it to pass 5-10 minutes to let people get their notifications that we were live and all that, but so many people were interested in seeing the unboxings that I ended up making them a part of the stream itself. Now I just play some music for a few minutes to get ready. I enjoy collecting knives and militaria. Have a whole lot of knives now (not even sure how many) and 9 swords. 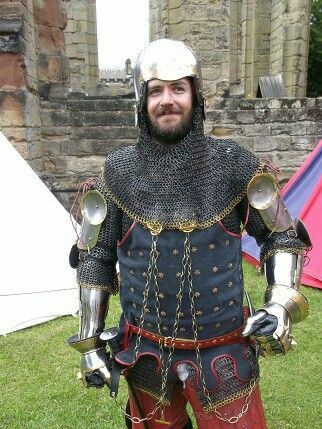 Also recently bought the last parts to have a full medieval armor too (halfplate, similar to this). Well my whole family are collectors/hoarders so I've a lot of collections of things, I think curiosities covers a lot of it... Lets see, Rubik's cubes (their a big one), skulls and fossils, hats, scientific instruments (mainly electrical based), movie props and figures (that weren't made by me) rings, pendants and walking canes. That's not counting all the other stuff I collect to make stuff with... Like glass eyes, clock parts, ect. There's probably more stuff that I've forgotten to mention!